DC Electro mangnetic brakes with shunt/series wound coil (Series KBD / KDT / KCH) A.C. Thrustor Operated Brakes ( Series KBT ), A.C. Clapper type. 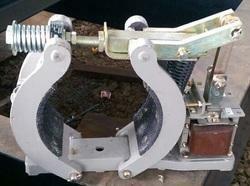 Electro-magnetic Braes ( Series KBA ), A.C. Solenoid Operated Brakes (Series KBS). Epoxy encapsulated class "F" insulated coils. kakku brakes series kbt are robust in construction and simple in design having minimum no. Of parts and thus, reducing maintenance problem and down time.the design of a kakku brake ensure efficient transmission of braking force , also the braking action is spread evenly our both the shoes providing maximum stocking power with minimum wear of shoe lining because of the large wearing area and close tolerance minimum wear of supporting pins is ensured. GENERAL:KAKKU brake rectifier panels are sheet steel enclosed floor mounting and free standing type, having two compartments. The top compartment is meant for resistance and the bottom compartment , contactors, Relay, rectifier bridge are mounting. 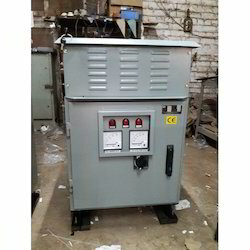 KAKKU brake rectifier panel are used in conjunction with DC Shunt brake of equipment’s having AC main supply e.g. EOT cranes conveyers etc for converting the AC supply to DC supply for operation of the DC electromagnets of the brakes. The standard rectifier panels are provided with silicon rectifiers. kakku heavy duty D. C. Electro-magnetic brake series kch are robust and simple in design having minimum no. Of parts. All parts are sturdy , readily accessible and easily removable thus reducing maintenance and down time. 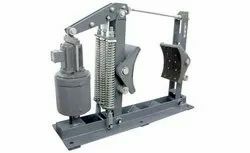 the over the wheel pull rod design of kakku brake series kch divides the braking force between the pull rod pins while transmitting the braking force to the outer shoe lever. As a result braking action is spread evenly over both the shoes, providing maximum stopping power with minimum wear of brake shoe. In these design bearing wear is also minimized at the shoe lever because of large bearing area and close tolerance fit of the lever. There are no complicated linkage. Type Stroke Length mm Max. Pull (Continuous Duty) Kg. Cat. No. Duty Cat No. Cat. No. Looking for “Brakes & Brakes Rectifier Panels”?